Catholes (cat holes) are for the most part the most accepted method of waste disposal in the backcountry... so if you plan to poop in the backcountry you will need to use one. 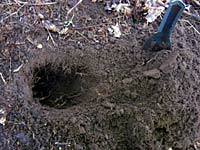 A cathole is a hole in the ground dug 6 to 8 inches deep and about 4 to 6 inches wide. They can be dug with a small hand trowel, with the back of your heel, or even with stick or a rock. Suitable areas for catholes are at least 200 feet from water sources, campsites, popular areas, or trails. Organic soils are better choices than mineral (sandy) soils. At popular campsites it is probably best if you can find a good spot as far away from camp as possible to reduce the concentration of catholes. Pick a location where people will be unlikely to walk or camp. For waste in a cathole to be more effectively decomposed, users must break up their feces with a stick and mix in organic soil. This is sometimes jokingly referred to as "poop soup". Organisms in the organic soil will help decompose the waste. It is important for the waste to be able to fully break down because human waste has pathogens that can contaminate ground and surface water. Don't burn your toilet paper. The paper burns fast and the ashes can fly away and possibly start a forest fire. Bury your toilet paper in the cathole or you can pack it out to prevent animals from digging it up. It's good to dispose of your greywater (dirty dishwater) into catholes as well. This prevents food particles and soap residues from reducing the water quality for other visitors and prevents food garbage from accumulating at the edge of water sources or around camp areas. Proper menu planning can help minimize your food wastes. It is best to pack out any food garbage versus burying it in a cathole because food attracts wild animals and insects. Be sure to use biodegradable soap when cleaning up.